Paducah School of Art and Design (PSAD) is pleased to present Legacy, an exhibition of works by and tribute to past and present middle and high school art educators within the region served by West Kentucky Community and Technical College. 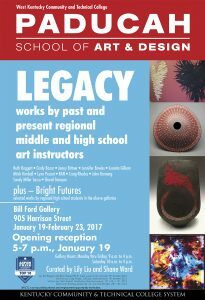 Legacy will open with a reception event from 5 p.m. – 7 p.m. on January 19, 2017 and run through February 23 in the Bill Ford Gallery, located within PSAD’s new 32,000 square foot 2D and Graphic Design Building in the Lower Town Arts District. Exhibiting artists include Ruth Baggett, Paducah Tilghman High School; Cindy Bazor, Massac County High School; Jinny Bittner, Ballard Memorial High School; Jennifer Bowles, Livingston County Middle School; Juanita Gilliam, Reidland High School (retired); Mitch Kimball, McCracken County High School; Lynn Pesoat, McCracken County High School; RAN (Miranda Meeks), Caldwell County Middle School; Craig Rhodes, Paducah Tilghman High School (retired); John Romang, Massac County Junior High School; Sandy Sasso, Calloway County High School (retired) and Shand Stamper, McCracken County High School. The exhibition was co-curated by Lily Liu, PSAD’s community education and public programs coordinator, and Shane Ward, PSAD’s new sculptor instructor. The Legacy exhibition is complemented by Bright Futures, a selection of high school student works which will be on display in PSAD’s alcove galleries at the same time. Participating schools include Ballard Memorial High School, Community Christian Academy, Graves County High School, Livingston County High School, Massac County High School, McCracken County High School, Open Door Academy, Paducah Tilghman High School, and Truitt Homeschool. The Bill Ford Gallery is located in PSAD’s 2D and Graphic Design Building at 905 Harrison Street in Lower Town, Paducah, KY. Gallery hours are Monday through Friday, 9 a.m. to 4 p.m.; Saturday 10 a.m. to 4 p.m.